It is no coincidence that the history of conservation and environmentalism in the United States largely tracks the development of water resources. Two pivotal environmental protection laws—the National Environmental Policy Act and the Endangered Species Act—are functionally integral to our water resources policies. Similarly, the nation’s agricultural policies are so deeply intertwined with water development that the two must be understood together. Despite its central place in our physical and policy world, water resources development is arcane and difficult for even the most dedicated student to understand. It is a babushka doll of policies, laws, and informal practices tracing to the Articles of Confederation, and few writers have succeeded in explaining it. Those who have include Marc Riesner in his classic 1986 book Cadillac Desert and John M. Barry in Rising Tide, published in 1998. 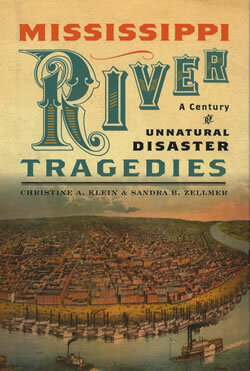 With publication of Mississippi River Tragedies, Klein and Zellmer join the list. Zellmer is the Robert B. Daugherty Professor of Law at the University of Nebraska-Lincoln and a nationally recognized attorney and scholar of water issues. She also brings to her writing a lifelong association with the Missouri River. Writing about the Mississippi developments encompasses the river’s vast and numerous tributaries, including the Ohio, Illinois, and Missouri. The Missouri is just one of these tributaries but is some 2,540 miles long and drains a basin of 530,000 square miles—about one-fifth of the continental United States. The Ohio River is 981 miles long, and its basin includes parts of the states of New York, Pennsylvania, Tennessee, Alabama, and Georgia. Thus, the authors are describing an audacious attempt to bring under engineering controls one of the world’s largest, least predictable, and most diverse water systems. Klein and Zellmer succeed in explaining the intricacies of water resources development by avoiding the plodding style of academic policy writing. They bring the topic alive by weaving a tapestry that includes history, personal recollections, literature, and anecdotes of the human condition. Ultimately, however, their story focuses on the great flood events in the modern history of the Mississippi River—the floods of 1902–1913, 1927, 1937, and 1993, as well as hurricanes Betsey in 1965 and Katrina in 2002—and the heart of the story is how these natural weather events were transformed into unnatural disasters by our national policy of constructing levees, dams, and channels. How is it, the authors ask, that Katrina, a relatively weak hurricane, could have destroyed an entire region? The answer is in a flawed water development policy that is responsible for causing unnatural disasters many times prior to 2002, making Katrina’s devastation altogether predictable. As a nation, we seem determined to ignore the lessons. Our great engineering structures do not stop floods but merely provide some modest tools with which to manage them. Despite this, layers of subsidies encourage development of homes, businesses, and towns in floodplains that will assuredly flood at some point. Simultaneously, the preflood subsidies are multiplied by postflood disaster payments, which represent a steady drain on the federal treasury. A compelling story within the story is the manner in which owners of floodplain land seek to double down on subsidies by claiming that, after the floods, the government should be required to pay damages for “taking” the flooded lands in violation of the Fifth Amendment to the United States Constitution. In fact, this scene is being played out today as Missouri River landowners who were flooded in 2011 are in federal court claiming that the manner in which the Army Corps of Engineers operated the upstream main-channel dams constitute such a taking. The authors aptly label this the “double-take.” First, landowners enjoy the benefits of a rich pile of subsidies, including flood control structures, land drainage systems, and channels. The federal Congress also provides the landowner with deeply subsidized flood insurance. Then, when flooding does occur (no matter that its severity was reduced substantially by upstream dams), the landowner enjoys the benefits of federal disaster payments. Not satisfied, the landowner then sues the federal flood control agencies, claiming that the floodwaters on her land represented a “taking” of private property for which damage payments should be made. This book is about the world we inhabit as we move into a new age of global warming and resource shortages. An earlier version of this review was published online by UNL’s Water For Food Institute.